Looking for creative and festive ideas for spicing up your holiday table? 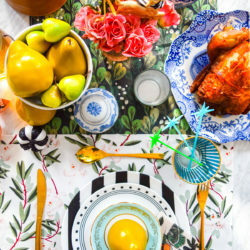 Mica May, founder of May Designs, visits the blog today to share how she created a lovely DIY Thanksgiving table using Spoonflower fabric and gift wrap! 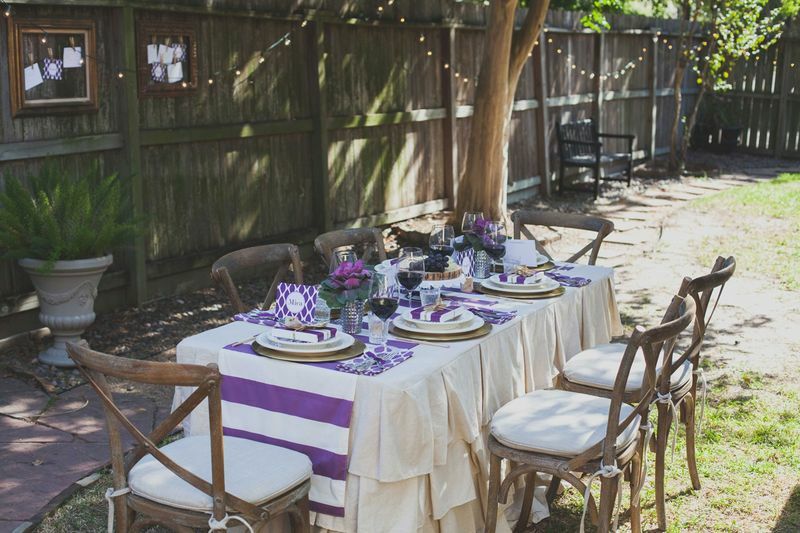 Pull up a chair and join us for a Thanksgiving DIY Dinner! 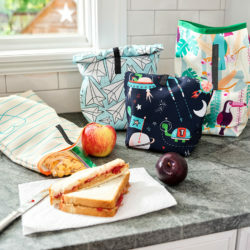 Here’s an inside look at how to use May Designs and Spoonflower at your holiday table this season. 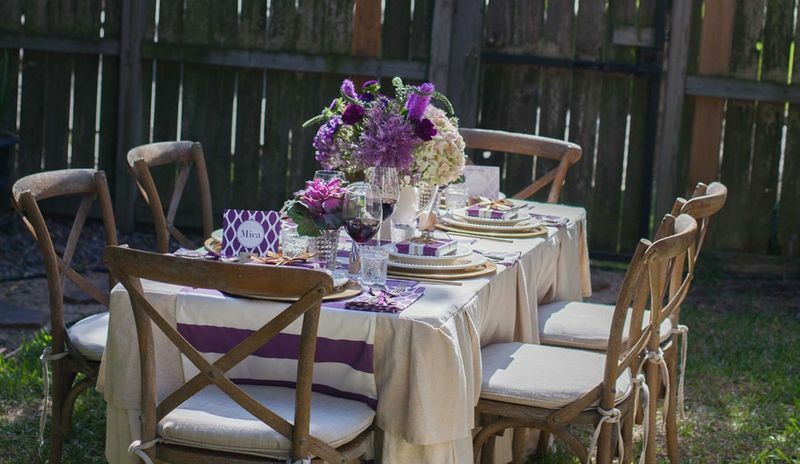 To start things off, we chose a color palette that we loved and stuck with it. We wanted something different than your typical bright orange & olive green, so we went with a more subtle fig, gold, and cream with lots of natural elements that added great texture. 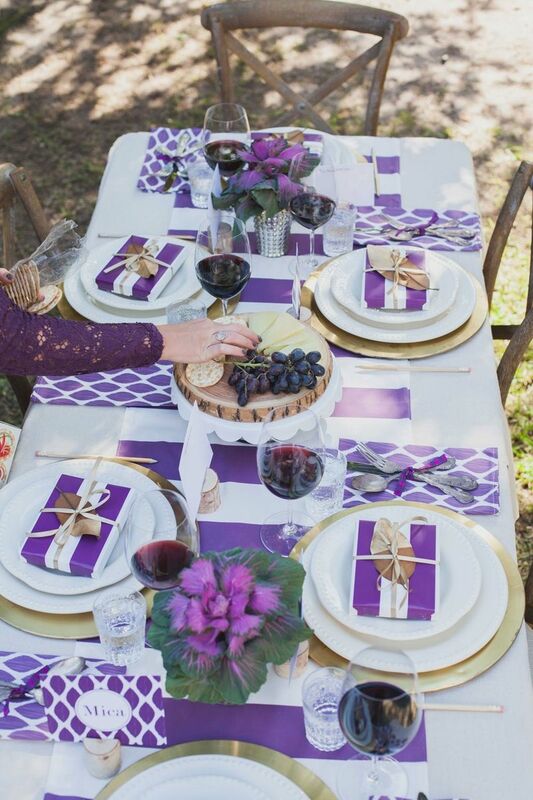 A fabulous tablescape always starts with the linens, and ours are all DIY! To anchor our look – we asked a talented friend to whip up a ruffled tablecloth out of a natural linen canvas to drape over a plastic folding table. 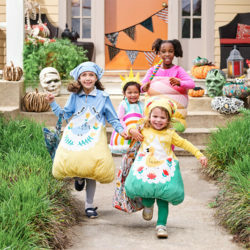 Good news: May Designs Fall & Winter patterns are now available in our Spoonflower shop so you can now purchase fabric, wallpaper, gift wrap, etc! woohoo!!! We can’t wait to see what you make, please use #mdfabric as you create your own projects so we can see them! 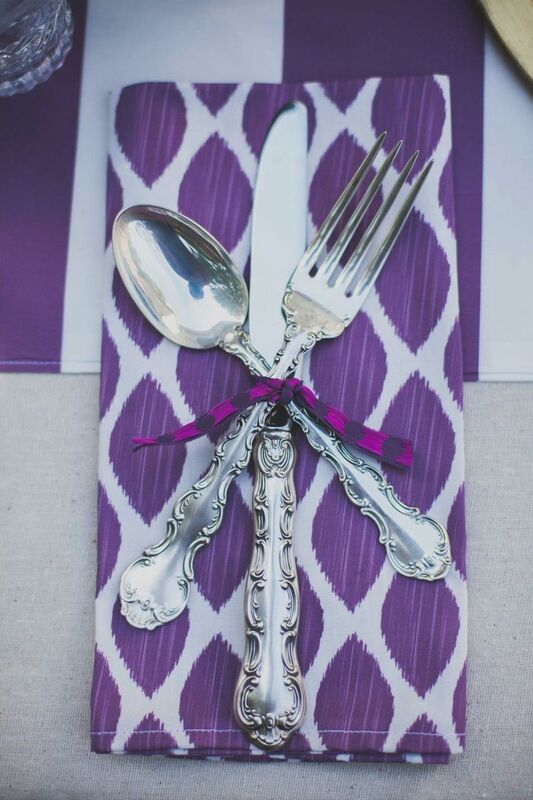 We ordered 3 yards of our rugby stripe in fig (table runner) and 2 yards of our ikat leaf in fig (napkins). 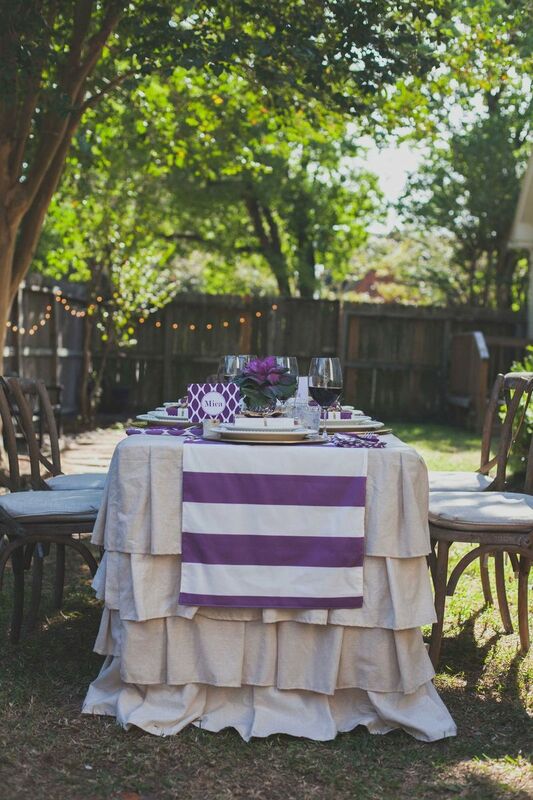 We doubled the fabric to make the runner nice and sturdy, added a seam around all edges, and without much trouble this fabric turned into a beautiful pop of color for a holiday table! We got a ton of use out of our monogrammed May Notes! We ordered a set for each of our guests with their first names on the front and the words ‘I’m thankful for…’ on the back. We used one card from the set to use as a place card with guests name and then included a pencil at each place setting and people wrote out what they were thankful for on the back! We put them in frames along our fence. 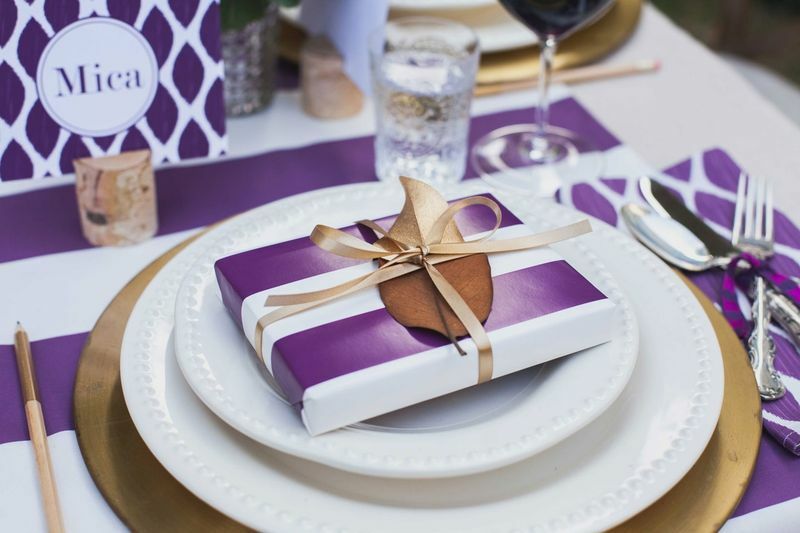 Additionally, since the sets come with 12 cards and we only used one for the place card, we wrapped up the remaining set of notes in our fig rugby stripe gift wrap (also from Spoonflower) and tied off with a silky gold ribbon as a gift for each guest! 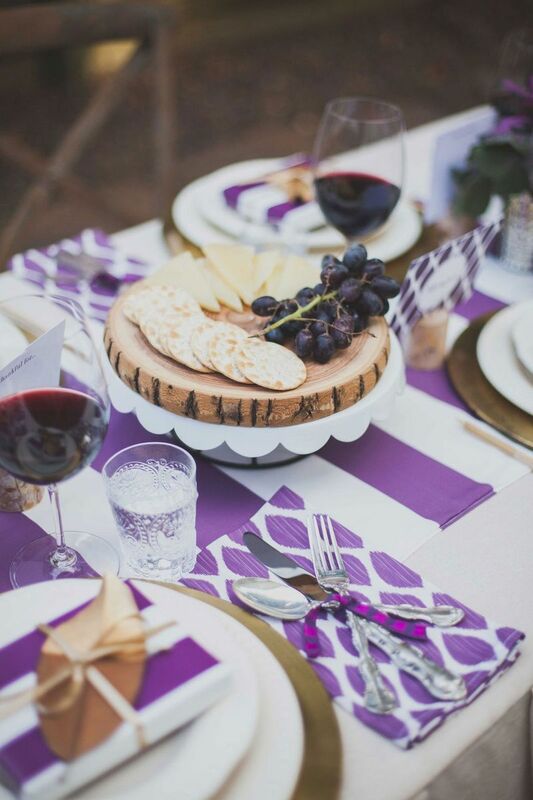 Perhaps our favorite part of this DIY tablescape… gold dipped details! We used gold chargers and wanted to add some small details to coordinate. since each place card doubled as a note, we needed pencils on the table. We loved the natural wood grain to match our birch twig place card holders, but couldn’t resist dipping them! instead of your basic gold paint (which is a little too yellow for what we wanted), we picked up some gold leaf and added a liquid adhesive. It worked great and was the perfect shiny gold! We also went across the street and picked up some fallen magnolia leaves and dipped those to slip under our thank you gifts to each guest. 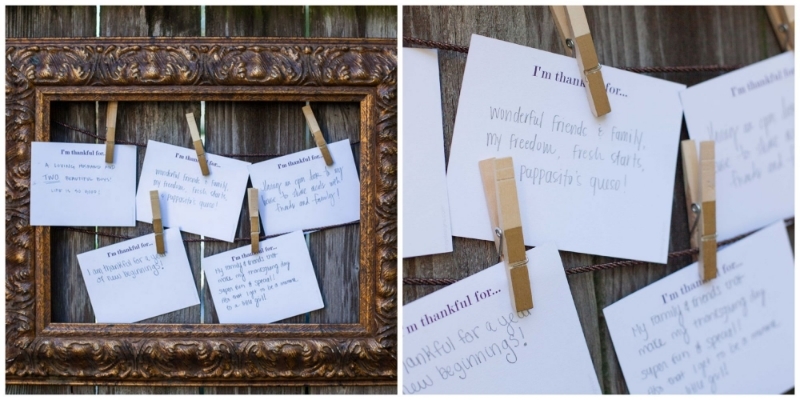 Lastly, we dipped some good old fashioned clothespins which we used to hang up our ‘thankful for’ notes in ornate gold frames along the fence! 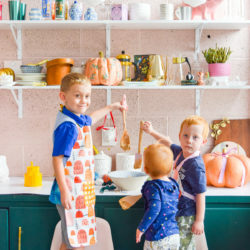 We had so much fun setting up this fantastic Thanksgiving dinner and hope that we have inspired you to call your friends and family and get them over for the holidays! If you do, be sure to show us on social media using #maydesigns! Can’t wait to see what you come up with! Mica May is the CEO of May Designs, a stationery company that makes it oh, so easy to dress up life’s little details. A devoted wife and mom of 3, Mica has become a powerhouse “mompreneuer” over the past 5 years in creating May Designs, and her commitment to maintaining a healthy work/life balance are evident in her “work hard, play hard” attitude. Thanks for posting! Which fabric did you use for the napkins and were you happy with it? I’m trying to choose a fabric that won’t wrinkle too easily but that still feels nice on your mouth.